People of Pagan and Tinian to take their appeal directly to Obama to save islands’ rare ecosystems from ‘irreparable damage’ and residents from forced re.location. If the Pentagon gets its way, a pair of idyllic Pacific islands have just two years before their tranquillity is pierced by the roar of US B-52 bombers, fighter jets and artillery fire. Faced with the destruction of their homeland, residents are to take their appeal directly to Barack Obama in an attempt to block US military plans to turn Tinian and Pagan – US territories that form part of the Commonwealth of the Northern Mariana Islands – into a simulated theatre of war. Campaigners say the arrival of thousands of navy seamen and marines on the tiny islands would obliterate rare coral ecosystems and wildlife, and force some residents to relocate. Cuban President Raul Castro received the prime minister and minister of general affairs of Curacao, Ivar Asjes, who is visiting Havana, the official newspaper Granma reported on Saturday.A press release says that Raul Castro, president of the Council of State and the Council of Ministers, held a fraternal meeting with Asjes on Friday afternoon. At the meeting, the two leaders exchanged opinions about the development of political ties and the opportunities to further boost trade and cooperation between the two countries, as well as other matters of regional interest. Asjes was accompanied by Jose Manuel Norberto Jardim, minister of finances, while the Cuban delegation included Council of Ministers Vice President Ricardo Cabrisas Ruiz, and Interim Foreign Minister Marcelino Medina Gonzalez, the press release concludes. The island was chosen ahead of the Cayman Islands, who had expresssed an interest but failed to submit a letter of support from its Government. The annual athletics championships was founded in 1972 by the Caribbean Free Trade Association (CARIFTA) and has two age categories, under-18 and under-20. Only countries associated with CARIFTA may compete in the competition. Sir Austin Sealy, then President of the Amateur Athletic Association of Barbados, inaugurated the Games to mark the transition from the Caribbean Free Trade Association to the Caribbean Community (CARICOM). 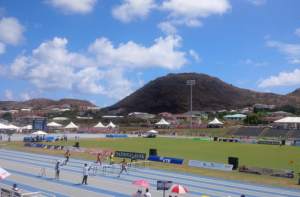 CARIFTA was meant to enhance relations between the English-speaking countries of the Caribbean after the dissolution of the West Indies Federation, but the CARIFTA Games took that idea a step further, including the French and Dutch Antilles. The Games have produced world record holders, Usain Bolt, Darrel Brown, world and Olympic champions such as Veronica Campbell-Brown of Jamaica, Kim Collins of St Kitts-Nevis and Pauline Davis-Thompson of the Bahamas, Alleyne Francique of Grenada and Obadele Thompson of Barbados.